this one is going straight from the garden to the salad plate! Kids say they don't like radishes because they're too spicy. Awwww . . . then they turn around and eat mega-spicy nacho chips and all kinds of spicy foods! Maybe this red, white and green salad, with its sweet juices, served in a small quantity per person, will change their minds. Especially when they've grown the radishes from seed themselves! 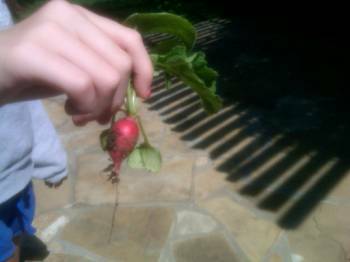 Be careful with radishes - they are soooo easy and fast-growing, they may come ripe when you're not looking. After a couple of days of ripeness in the soil, they tend to split open and then critters get inside and ruin things. So if you see the telltale red spot in your radish patch, pull it up, cut off the leaves except for an inch or so, and stash it in the refrigerator, dirt and all, 'til you have enough for this fun recipe. In a mixing bowl, add the juices and sugar and whisk 'til the sugar dissolves. Season with just a little salt and pepper. Wash the radishes and trim off the root and stem ends. Cut into four or six wedges. Hopefully, you are also growing cilantro in your garden, and that's fun to rinse off and chop off. Also chop red onion. Add these veggies to the dressing in the bowl, and toss. Refrigerate for 30 minutes, toss, and refrigerate for another 30 minutes before serving.